It is common for children to dislike going to see the dentist. This feeling may have developed from the stories they’ve heard, because they had a bad experience, or simply because they don’t like new environments. Dental tools, the big lights, the big chair, shots and even drills can be very intimidating for anyone- especially kids! Not all children dislike dentists, though. There are some who are comfortable and are happy to visit a dentist. If that’s not the case for your child, here are some tips to make the visit a little easier. Start them young. Bring your child to the dentist before they start school at least twice a year. As soon as your child gets their first tooth,you can go ahead and schedule their first appointment. Even at such a young age, it is important to make sure your child has healthy teeth. This will help your child be comfortable from the very beginning. Bring your child to the office prior to the dental schedule. Allow your child to see the dental office, meet the dentist and the staff. Let him sit in the dentist chair, talk to Dr. Voyles and his staff, see and play with the tooth models, look at the teeth x-rays. You can bring them along to a family member’s appointment, or you can call your dentist’s office and ask for a good time to bring your child in for a tour. Keep a positive attitude. Don’t go into too many details, but prepare your child by telling them everything the dentist will do. Schedule the dental visit before a fun or special activity and remind your child of the activity during the office visit. Bring a cool pair of sunglasses. Wearing sunglasses will help with the bright light. Your dentist might have a pair they can borrow, but bring along your own pair just in case. Dr. Voyles has kids of his own and loves having kids as patients. He will help your child feel comfortable and have a fun time while visiting the dentist. 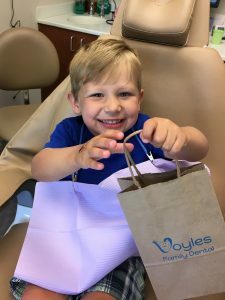 Call Voyles Family Dental and set up cleanings for the whole family.